Mexico’s growing appetite for inexpensive US natural gas provides a welcome release valve for production from the prolific shale plays north of the border. 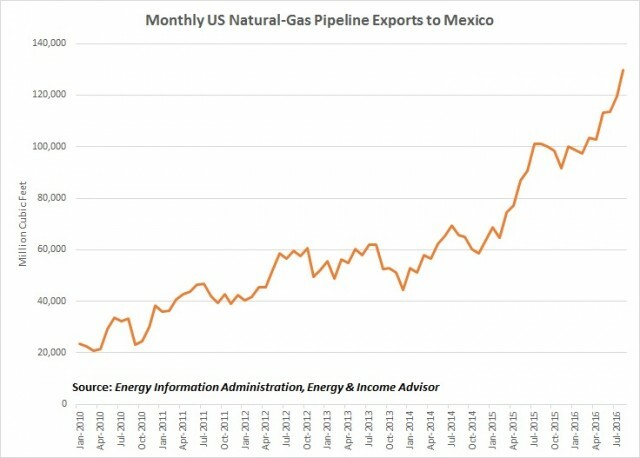 Exports of US natural gas to Mexico exceeded the volumes piped to Canada for the first time in 2015, reflecting a 44 percent upsurge in shipments south of the border. This trend has continued in 2016, with US pipeline exports of natural gas growing by 32 percent year over year. 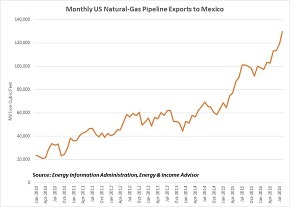 All signs point to US exports of natural gas to Mexico growing significantly in coming years. Mexico’s gas output has hovered around 5.5 billion cubic feet per day since 2009, while consumption has increased to 8 billion cubic feet per day. 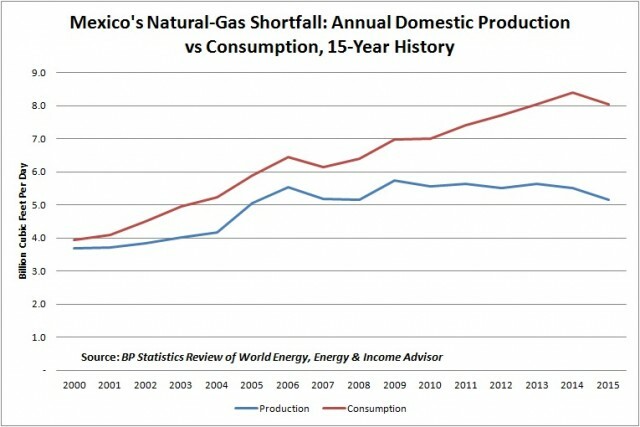 With the country’s major oil and gas fields aging and production in decline, the government had expected to rely on imports of liquefied natural gas (LNG) to meet demand and had built three regasification facilities to accommodate this trade: Altamira on the east coast (2006) and Ensenada (2008) and Manzanillo (2012) on the west coast. The shale gas revolution north of the border has prompted Mexico to pursue less expensive pipeline imports; today, the country’s regasification terminals operate at a fraction of their nameplate capacity. Mexico’s state-owned power company also plans to more than double its generation capacity over the next 14 years, with gas-fired power plants accounting for the bulk of these capacity additions. Including growing demand from Mexico’s all-important manufacturing industries, the Ministry of Energy expects natural-gas consumption to increase at a compound annual rate of 3.4 percent through 2028. Growing exports to Mexico will provide a demand outlet for US natural gas, though the volume of cross-border shipments probably won’t have a meaningful effect on pricing–America produces about 76 billion cubic feet of gas per day. This trade also depends on the construction of additional pipeline capacity, which means that US natural-gas exports to Mexico will grow in a lumpy fashion. 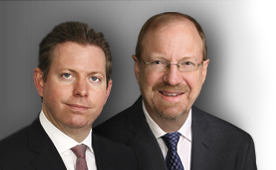 These trends create growth opportunities for US pipeline owners with well-positioned assets as well as their counterparts south of the border, especially with the emergence of the MLP-like Fibra E structure for infrastructure companies. As part of our ongoing effort to bring our subscribers the best analysis and intelligence, the Energy & Income Advisor team attended the DUG Midcontinent conference at the end of October to meet with key players in the region and learn about the risks and potential opportunities. 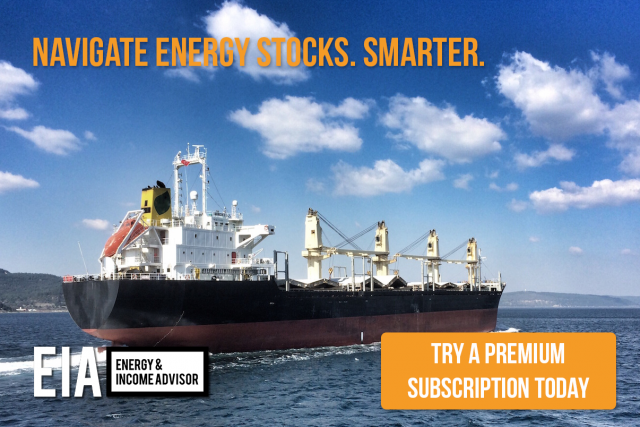 We shared our key takeaways from the event and our best ideas in an exclusive report for Energy & Income Advisor subscribers. If you haven’t joined our service yet, now is the perfect time to become a member. On the fence about subscribing? 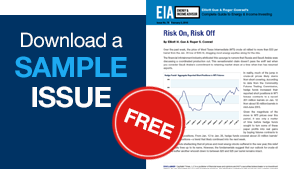 Click here to download a free sample issue of Energy & Income Advisor to find out what we’re all about.